This semester the business library book display theme is Sustainable Business. 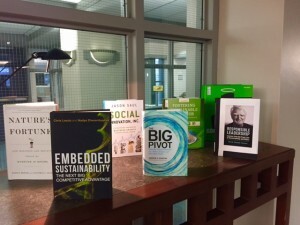 The display is located by the entrance of the business library. If you are unable to stop by in person, you can view the display online. All of the books are available for check out. New materials will be added during the semester. Thank you to Dave Collins for his support in the development of this collection and to members of the Tippie Sustainability Committee for their title suggestions.